Did you know that the most common exposure to toxins is from everyday products in your house? From the strawberries you eat to the bleach you use on your kitchen counters, you may have hidden hazards in your home. A household hazardous product is a product meant for use in and around the home and is hazardous due to ingredients that may be flammable, reactive, corrosive or toxic. This means that such a product can be easily ignited, react with another substance to create fire or toxic gases, cause a chemical reaction that could burn through skin, or result in injury or death if swallowed, inhaled or absorbed. Everyone is at risk from hazardous products through the food they eat, the air they breathe and the surfaces they touch. Pregnant women and young children are especially vulnerable. Avoiding exposure to toxins during pregnancy is critical since toxins travel through a mother's placenta to her baby through the umbilical cord. Scientists are concerned that exposure to hazardous products during a child's development may be linked to learning disabilities, cancer or brain damage. Despite the potential for toxins in the environment to make their way into our bodies, breastfeeding is still a recommended practice for new mothers. Breast milk is rich in growth factors, germ-fighting antibodies and proteins for babies' needs. Because newborns and infants have small bodies and their internal organs are still developing, they are more readily harmed by hazardous products. Young children tend to crawl on the floor, play on the lawn and put objects in their mouths, actions which are all sources of potential exposure. Children also eat more in relation to their body weight than adults. This increases their chance of exposure to pesticides in food. They also eat more of a single type of food, such as cereal or apples, increasing their exposure to a particular pesticide. Chlorine bleach, disinfectants and flea shampoos are all hazardous products that are poisonous if used incorrectly. According to the American Association of Poison Control Centers, 92 percent of poison exposures occur in the home and cleaning products are one of the most common forms of poisoning for children under the age of 6. In 2003 alone, the Poison Control Centers said, over 20,000 children were exposed to or poisoned by household chlorine bleach. Purchasing safer products can protect you and your child. The U.S. Environmental Protection Agency found in a survey that almost half of all households with children under the age of 5 had pesticides stored in an unlocked cabinet less than 4 feet off the ground. Properly storing pesticides out of reach of children is an important first step in protecting them from exposure. Pesticides like weed killer are often tracked into your home with the dirt on shoes. Taking off shoes before entering your home can significantly lower this risk. Pesticides are used on food to control insects, weeds and bacteria. According to an Environmental Working Group study, 20 million American children age 5 and under eat an average of eight pesticides a day. Such chemicals are suspected by many scientists of causing damage to the brain and nervous system in children. 1. Use the precautionary principle. It is better to be safe than sorry. If you are unsure of the effects of a product or what levels of exposure are dangerous, simply avoid using that product. 2. Read the label first. Household cleaning products, pesticides, pet products and even some produce can be dangerous if you use too much. Read the label to find the warnings on usage. 3. Avoid products with a "signal" word on the label indicating they are hazardous. Products with "Caution" or "Warning" on their label are safer than products listing "Danger" or "Poison." The safest products are those without a signal word. 4. Store household hazardous products in childproof containers where children can't reach them. Never transfer hazardous products to containers that children may associate with food or drink. Be sure to remove your shoes and wash off dirt before entering your house, as pesticides are often tracked in from outside. 5. Choose safer alternatives. Kids can still stay healthy by eating fresh fruits and vegetable. Wash veggies thoroughly, peel if possible and select a variety of foods to avoid overexposure to a particular pesticide. Try to substitute known pesticide-grown foods with organic foods. Donna Miscolta is a project manager for the King County Solid Waste Division and Local Hazardous Waste Management Program. She holds masters' degrees in education and public administration. Children's Environmental Health Coalition and the Institute for Children's Environmental Health: Learn about actions you can take to protect children from health and development problems caused by exposures to toxic substances. Environmental Protection Agency: Obtain information about environmental risks to children. Food News: Read the "report card" on pesticides in produce prepared by the Environmental Working Group, and see a list of least-contaminated produce items. Green Cleaning Recipes: Make your own non-toxic alternatives to hazardous cleaners and rid your home of hazardous products. Local Hazardous Waste Management Program: Locate a variety of resources on hazardous products, safer alternatives and disposal. Find videos, brochures and publications on hazardous waste topics. Washington Toxics Coalition: Find fact sheets and other resources on toxins in the home. Every family can do their part for a cleaner environment. The key, experts say, is to help your kids make a better connection with nature by encouraging outdoor play and exploration, and to instill environmentally friendly habits in your family. 1. Limit your kids' time on video and computer games and encourage outdoor play instead. 2. Leave an open area in your yard where younger kids can hunt for bugs, play in the dirt and create streams. 3. Take your kids on walks through parks and discuss what they see, from signs of wildlife to falling leaves. 4. Encourage middle- or high school-age kids to learn more about environmental issues through volunteer projects. 5. Involve the entire family in outdoor volunteer clean-up and restoration projects at area parks and beaches. 6. 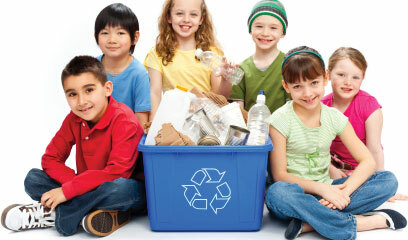 Model good environmental practices for your kids and encourage your family to conserve, reuse and recycle. 7. Make your home eco-friendly. Purchase or make your own non-toxic alternatives to hazardous household cleaners and practice natural lawn and garden care. 8. Become familiar with pesticides commonly found in produce; consider purchasing organically grown food when possible -- or grow your own. 9. Properly dispose of toxic products (pesticides, herbicides, paints, cleaners, etc. ).